Our beloved Kaiya was the first Malamute to come into our home. She came to us from Krystalmar Alaskan Malamutes. She was so loving and kind. She changed our lives for the better and we are hooked on this breed forever. Her nickname was Momma Bear because she started our breeding program. She was not a show dog but that did not matter one bit to us. She was our "heart dog", as another breeder said to us once. She will forever be in our hearts. 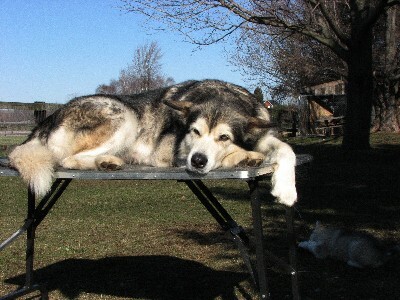 Berahug's Cheyenne of Glacier T.T. CH Keikewabic's Crystal Kim T.T.